The Orkney Folklore & Storytelling Centre - A Centre for Heritage Tourism. "We cannot live life fully without the treasury our ancestors have left us"
Peatfire Tales of Orkney: A magical evening of storytelling & social customs around our peat fire. Tuesdays & Fridays from 8PM - for 8:30PM storytelling start. Adults £10/children £6. Island Tales & Ales: An atmospheric evening of storytelling & social customs, enjoy a complementary Orkney drink whilst listening to Island Legend and Lore around the peat fire. Sunday & Wednesdays from 8PM at the Still Whisky Bar, Stromness Hotel. Cost £10 per person. Book with Lynn or at Stromness Hotel. Private group bookings : 6 - 35 guests offering a bespoke "A Taste of Orkney" tailored to group interests. Includes Island Legend & Lore, Social Customs, Traditional Orkney dance & music. Handfasting & Wedding groups welcome. A Guided Town Walk (STGA qualified) - Stromness Heritage Tales - The 400 year history of the local seafaring characters & Stromness maritime heritage. £7 per person, 1.5 hours duration approx, offered daily. Meeting point outside Stromness VisitOrkney Information Centre. A Guided Coastal Walk (STGA qualified) Scapa Flow History & Wartime Heritage Walk - where natural beauty meets island history at the Northwest entrance of Scapa Flow. £7 per person, 1.5 hours duration approx, offered daily Meeting point Stromness Museum, Alfred Street. Small, private groups welcome, both walks can be combined by arrangement. 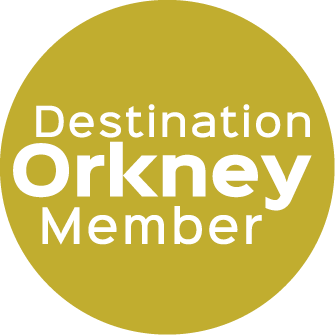 As a centre of Orkney Heritage Tourism we welcome you to listen to the Orkney Islands oral traditions of storytelling, ballads, sagas, song & poetry with a particular emphasis on the Island fishing & farming peoples & their traditions. Discover who these "Fisherman With Ploughs" are as George Mackay Brown called them in his "Poem Cycle". Experience the past Islander's sea legends, crofting tales, customs & beliefs, how their Island calendar & partnership with this ancient landscape & surrounding seas has shaped today's social landscape on these North Atlantic Islands. Sit in candlelight by the peat fire & browse through the local social customs & heritage, exploring the old Orkney books, newspapers, prints & photographs. Listen to local Orkney music or dialect while exploring contemporary Orkney writer's books including George Mackay Brown & Gregor Lamb or Island craft books & the children's Orkney books such as Faraway World: An Orkney Boyhood by W. Towrie Cutt. the feeblest of glimmers, with the old soft mouths at the edge of darkness. telling their spells & stories over & over again"
Explore our outdoor creative space inspired by the four elements - Earth, Air, Fire & Water set in the ancient landscape of Via. From the old Norn word "Veeo", "Via" means "a sacred place" - discover the story of the Stones of Via & the Bronze-age burial mound. Let your imagination wander whilst sitting surrounded by sculptures & forms created from recycled materials inspired by characters of Island folklore & legends. Donations welcome for local charities or not for profit organisations connected to fishing & farming communities. On Tuesdays & Fridays evenings you are invited to gather round our peatfire to listen to the magic of these North Atlantic Islands legends & myths. Indigenous music, rhymes, customs & dances are woven through this Island tapestry of storytelling. In our Folk Arts studio travel back with us in time to when the stories, tales & crafts of the fishing & farming Islanders were passed on from one generation to another through their oral traditions. to their hard work of ploughing & fishing"
The Stromness Hotel's private Still Room Whisky Bar has a rich heritage of the fishing & farming people of Stromness sharing their daily stories about real people, real lives & real places at the end of the day over a jar of ale or nip o' whisky. Share an evening in the Still Room Whisky Bar reminiscent of a 19th Century Stromness ale house. Sit around the peat fire, at your candlelit table & enjoy a complimentary drink on us whilst listening to the legends, customs & social heritage of the Island people who worked the land & fished the sea. Wednesday & Sunday night from 8PM to hear sea-salted tales of Stromness including smugglers, seamen, The Tales of the Tide & The Selkies songs. The Still Room Whisky Bar is on the second floor of the Stromness Hotel, next to the reception. Workshops are led by Lynn Barbour who has extensive experience in communication arts, drama & dance along with the design of mask & puppet theatre. Lynn has developed creative learning programmes to use storytelling as a tool to help stretch the imagination & build the confidence in children who have difficulties in social skills, education & communication. Workshops are interactive where children & adults alike can create their own stories, tell their own tales, sing their own songs & rhymes...Leave Orkney with your own folklore inspired puppet or mask. All materials are provided & include recycled & locally sourced items. Light Orkney refreshments provided also including Orkney fudge & biscuits. "Stromness is a ballad in stone. Explore the old pier & hidden closes, listen to the Stromness Maritime heritage & town history, discovering the local seafaring characters from the last 400 years. £7 per person,1.5 hours duration approx. Walk along the West Shore path from the Stromness Museum, stand at the North West Entrance of Scapa Flow where natural beauty meets Island history. Discover the wartime heritage of these North Atlantic Islands from the Napoleonic wars through to the Second World War. Photograph Hoy, the High Island & Graemsay, the Green Island. £7 per person, 1.5 hours duration approx. Daily, booking essential call/email 01856 841 207 / peatfire@Orkneyattractions.com. Meeting point Stromness Museum, Alfred Street.